Thread: full suspension single speed? Recently, I bought a full suspension frame to build up, owing to the fact that I was recovering from a broken knee. Now, I keep 18 and 20 tooth SS's for my main rides, but hey, this FS frame actually works, with almost no pedal bob. Dont laugh, but it's a Schwinn rocket, 7005 aluminum, full sealed bearing pivots, depending on who you listen to a licensed version of the DW link, or GT I-Drive, or Mongoose Freedrive system. 2 of the three owned by the same company, by the way). Anyways, has any one had any experience in SSing a similar frame? I figure on having to use a tensioner, just looking for input. Actually none of the above...the rocket frames were licensed evolutions of the Lawhill 4-bar design previously used by Schwinn for their 4-banger, 6-banger and 8-banger models as well as used by Yeti around the same time as they were then owned by Schwinn. The Mongoost freedrive is a licensed version of the GT I-Drive patent and both are floating BB designs. The DW-Link is a totally different 4-bar VPP design and is owned by and named for the owner of Evil Bikes and E-13 components and licensed only to Iron horse and Ibis so far. You would need a tensioner with all of those as they all experience some chain growth as the suspension compresses. This ought to be a fun project, if it works well. I rode the bike a few times in thick mud, and figured out fast that the front reailleur is there to pile mud on. When you mentioned floating bottom bracket, did you mean that it moves on a pivot separately from the main triangle of the frame? Thats how the schwinn is set up. It's a strange design, the action of pedaling trys to counteract bob. They call it Iso-Drive. Seems to work, though. I have been riding SS FS for over 6 months now with no problems. I converted a S-Works Epic, the FSR suspension design doesn't use chain tension to work so i don't need to worry about chain tension. I am using a 32:20 with 1 half link and it works fine. If you do convert to SS you might want to try a Pauls chain tensioner it works like a small rear derailleur, it would depend on the rotation of the rear wheel while the suspension is activated. I would say give it a try and see what happens. I have a Weyless SP (Heckler Clone) I run SS. I use a Paul Melvin, cures a lot of possible problems. Yeah, I'd already pretty much decided on the pauls melvin tensioner. I've tried a couple single jockey wheel tensioners in the past with so-so results. In fact, they influenced me to go with an Eno on one bike, and to braze in new dropouts on the other. This is getting to be a habit. First I rationalize a 2nd SS because of a different tooth count on the rear cog, now I want a FS to play with. Oh well why fight it. Oh you've got one of the new rockets... its an I-drive variant as schwinn and GT are both owned by Pacific Cycles. I thought you meant one of the older Rocket 88s. Lakerfan - are you saying that your chain on the Epic doesn't loosen or get tighter with the suspension movement? Have you ever dropped the chain in the 6 months you’ve been ridding it? If there’s no change in chain stay length – that could be an “Epic” discovery for the FS SS fans. 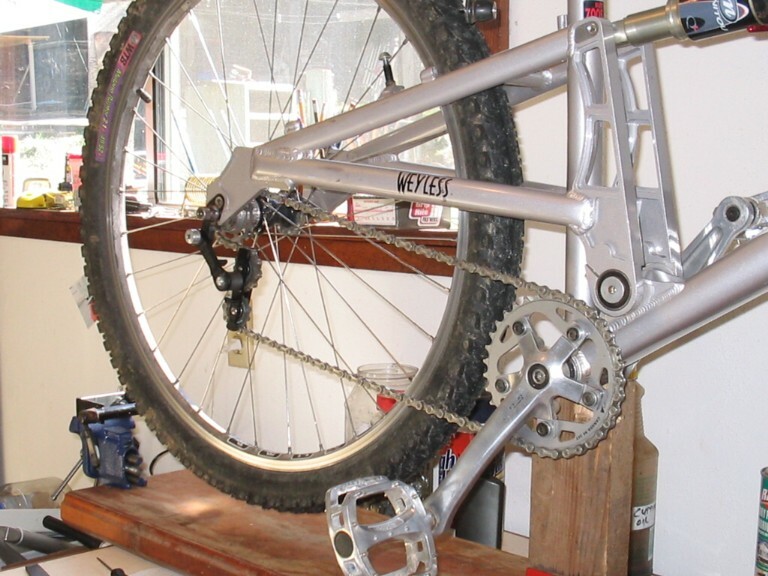 You can FS SS anything if you use a chain tensioner. I just built up a Kona A which has a concentric BB design. It seems that the RP3 shock keeps pedal bob to a minimum and absolutely no chain growth. The first two the BB is part of the swingarm while with the third the wheel is rotating around the center of the BB so in all of them the distance from the axle to the BB center is always the same. I would like to add that my Ti Dean FS also pivots about the BB and won't experience changes in chain tension. I never dropped a chain riding my epic without a tensioner. I did notice some chain tension, not enough to worry about a broken chain or locking out the suspension but enough to put on a Melvin tensioner, which works well. I will post some pics in a couple of days. I finally got around to working on the fs bike, took off the derailleurs, shifters, and put on a lighter handlebar and front wheel. Then I pulled the shock, took off the spring, and put the shock back in the frame to check what the chain was doing during rear wheel travel. It got looser, but not a whole lot. Set the chain length, replaced the spring on the shock, and installed a used tensioner (still trying to get a good deal on a melvin). Took it for a test ride, and remembered that the tensioner had given me problems before. Scratched my head and decided that the XT rear derailleur would work for now. Installed it, and the next ride was much better. The bike seemed better in all respects, I'll try to get it out today on the trail if it dries out some, lots of rain the last week. My riding partners have always razzed me about my reluctance to use a derailleur as a tensioner, but I can live with it for a while. Form follows function. If it works well on the trail, I'll start shopping for a lighter fork. Well, took the bike out today. I figured a little mud would make for a better test. It rode well, no chain issues. 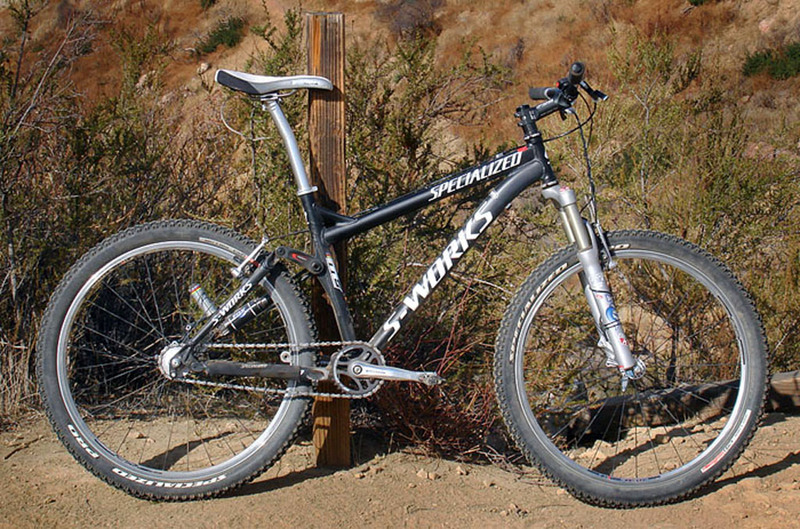 With an 18 tooth cog, it was about the same as my 18 tooth hardtail, which suprised me. Schwinn's Isodrive (or Mongoose's Freedrive) suspension really does work well.